Precision weighing equipment is extremely sensitive, which means that even the slightest disturbances can significantly affect measurements. These 12 tips can help you conquer the common challenges with weighing and improve your performance. 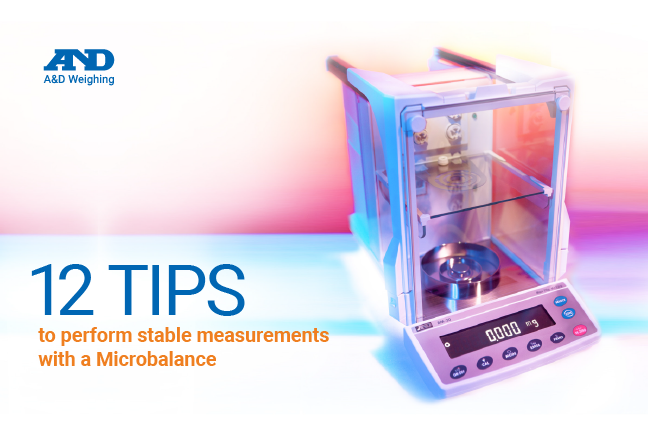 This guide can help you get familiar with the do’s and don’ts of installing and operating your microbalance to achieve stable measurements for any weighing application. Learn how you can monitor humidity fluctuations and maintain your laboratory’s ideal ambient temperature to ensure measurement accuracy. Identify what kind of changes affect the stability of your microbalance and learn how to control environmental conditions. Learn how you can handle the effects of static electricity and what container materials are best suited for specific weighing conditions. Get tips on proper sample handling while performing weighing procedures inside the weighing chamber. Find out how you can perform stable measurements with your weighing equipment through these 12 steps. A&D Weighing has been providing industry-leading precision weighing and measurement equipment to laboratories across the world for over 40 years with operations in the United States, Germany, Japan, Australia, Korea and Great Britain. At A&D Weighing, you can rest easy knowing that each piece of equipment passes through the highest of quality standards at our ISO 9001 certified facilities. We offer a complete line of electronic balances, digital scales, weighing indicators and controllers, load cells, and non-destructive measurement equipment. On top of that, we also provide worry-free and convenient warranty services for guaranteed product performance and quality satisfaction.